The 'Field Trial' Trimphones were used in the GPO's trials of the Trimphone from 1965 to 1967. The original plan was for 1000 phones to be available on a trial basis in the London North West area and for the phones to be available to everyone after the trial had finished. The trial lasted much longer than planned and field trial phones made in 1966 and 1967 can also be found. 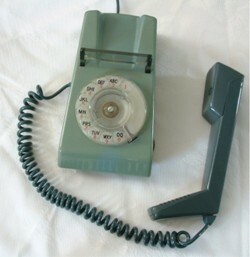 The Trimphone became generally available in 1968. The original batch of 1000 phones were white. Standard Telephone Company (STC) supplied another 9000 phones between 1966 and 1967. The GPO then placed an order for 30000 phones. The field trial phones are all of type 712 Mk1 or Mk2. How do you spot a genuine 'Field Trial' Timphone? What do the numbers on the base mean? This is our guide to finding and buying a Field Trial Trimphone. 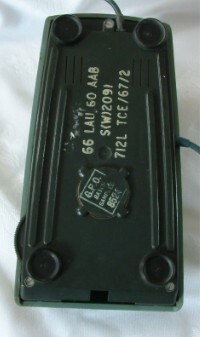 The main visible difference between the 712 and the 722, which replaced it is the absence of the plastic screw in the area where the handset rests. This was not needed, as the case was fixed by three screws underneath. There was a nylon screw the top of the handset towards the back, not the metal screw on the back of the handset as seen on later models. 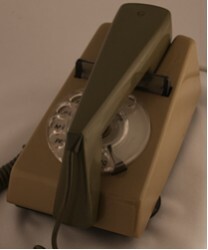 The first trial versions of the Trimphone (1965) were all two-tone grey. The following year, two-tone blue, and green/brown were added. This is a 712 mk2 Field Trial Trimphone from 1967. You can clearly see the lettered dial on the photograph of the blue two-tone Trimphone above. Identifies this as a 712 Mark 1 or 2. Inside the differences are clearer. For a sophisticated product, the original Trimphone was remarkably old fashioned. Most of the circuitry is the same as the much larger 706. It was a tight fit! The 712 was also much heavier than the 722. Some of the problems associated with the 722 moving when dialling were less evident in the 712. The 712 was succeeded by the 722, which is much more common. The 722 was not the finished product. 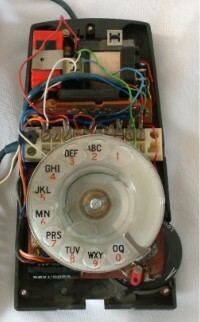 It went through a number of changes before arriving at 2/722, which was the Trimphone of the 70s.